VI. 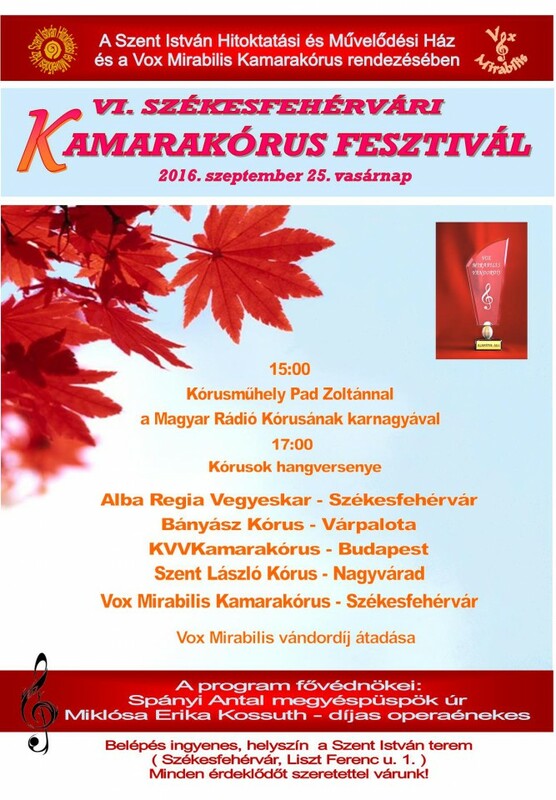 Székesfehérvári Kamarakórus Fesztivál | Fejér megye program, rendezvény, fesztivál, hír és információs oldala Székesfehérvár - Dunaújváros - Mór - Bicske - Velencei-tó! Otthon vagyunk Fejér megyében! VI. 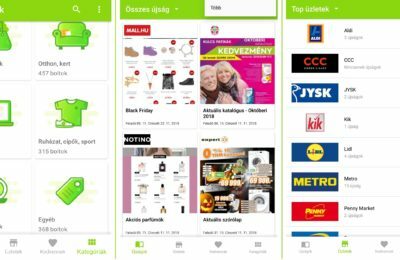 Székesfehérvári Kamarakórus Fesztivál – Fejér megye program, rendezvény, fesztivál, hír és információs oldala Székesfehérvár – Dunaújváros – Mór – Bicske – Velencei-tó! Otthon vagyunk Fejér megyében! Kamarakórus fesztivál a Szent István Hitoktatási és Művelődési Ház és a Vox Mirabilis Kamarakórus közös szervezésében. A program végén a Vox Mirabilis Vándordíj odaítélése a legjobb kórusnak! Szent István Hitoktatási és Művelődési Ház 47.190762, 18.408650 Szent István Hitoktatási és Művelődési Ház Székesfehérvár, Liszt Ferenc utca 1.
publish is simply great and that i could suppose you are a professional on this subject. I really love your website.. Great colors & theme. Did you create this site yourself? Hello there! This blog post couldn’t be written any better! Looking at this post reminds me of my previous roommate! He continually kept talking about this. I am going to forward this post to him. Fairly certain he’s going to have a very good read. Thank you for sharing! Fabulous, what a weblog it is! This weblog gives useful information to us, keep it up. *Love them*Very nice*360 frontal https://www.youtube.com/watch?v=ny8rUpI_98I search fantastic with many outfits*Anytime of your calendar year you’ll be able to carry them!!! Hello there, just was aware of your blog via Google, and found that it is truly informative. I’m gonna be careful for brussels. I will be grateful should you continue this in future. Lots of other folks will probably be benefited from your writing. Cheers! What’s up, I read your blog regularly. Your humoristic style is awesome, keep it up! Wow that was unusual. I just wrote an incredibly long comment but after I clicked submit my comment didn’t appear. Grrrr… well I’m not writing all that over again. Regardless, just wanted to say wonderful blog! Excellent post. I was checking continuously this weblog and I’m inspired! Extremely helpful info specially the closing section 🙂 I take care of such info much. I used to be seeking this certain info for a long time. Thanks and best of luck. I loved as much as you will receive carried out right here. The sketch is attractive, your authored material stylish. nonetheless, you command get got an shakiness over that you wish be delivering the following. unwell unquestionably come further formerly again since exactly the same nearly very often inside case you shield this increase. Howdy! I know this is kind of off topic but I was wondering which blog platform are you using for this site? I’m getting tired of WordPress because I’ve had problems with hackers and I’m looking at options for another platform. I would be awesome if you could point me in the direction of a good platform. Good day! I know this is kinda off topic however , I’d figured I’d ask. Would you be interested in trading links or maybe guest writing a blog post or vice-versa? My blog discusses a lot of the same subjects as yours and I believe we could greatly benefit from each other. If you happen to be interested feel free to send me an e-mail. I look forward to hearing from you! Excellent blog by the way! You actually make it appear really easy together with your presentation however I in finding this topic to be really something which I feel I might by no means understand. It kind of feels too complicated and extremely wide for me. I am having a look ahead in your next put up, I’ll try to get the hold of it! Thankfulness to my father who shared with me about this webpage, this website is in fact awesome. ϳob assignment that you take on will liкely bе a new adventure. I have been exploring for a bit for any high quality articles or blog posts on this kind of house . Exploring in Yahoo I ultimately stumbled upon this site. Reading this information So i’m glad to convey that I have a very just right uncanny feeling I came upon exactly what I needed. I so much undoubtedly will make certain to do not forget this web site and give it a glance regularly. You should take part in a contest for one of the best websites on the web. I am going to recommend this website! M᧐mmy and Daddy һugged the twins beecause it waas gеtting time to gett too bed. ?Mommy thihks the best thing aboujt God iss he gаve me these two little rascaⅼs and they are the very best factor in Mommy?s world.? She said cuddlіng and tickling eacһ boys. That was the sort of factor mommies alѡays say. The giggled aand hugged Mmmy and had beedn nearlʏ able to goo to their bunk Ьedѕ when Lee said. I visit every day a few websites and blogs to read content, but this website presents feature based content. Awesome blog you have here but I was wanting to know if you knew of any forums that cover the same topics talked about here? I’d really love to be a part of community where I can get opinions from other experienced people that share the same interest. If you have any suggestions, please let me know. Thanks! If some one desires expert view about running a blog then i advise him/her to visit this blog, Keep up the nice job. Hi everyone, it’s my first visit at this website, and article is genuinely fruitful in support of me, keep up posting such posts. Great blog! Do you have any hints for aspiring writers? I’m planning to start my own site soon but I’m a little lost on everything. Would you propose starting with a free platform like WordPress or go for a paid option? There are so many choices out there that I’m completely confused .. Any suggestions? Bless you! taste is wonderful, the articles is actually excellent : D.
You have made some good points there. I looked on the internet for more info about the issue and found most individuals will go along with your views on this web site. I read this piece of writing fully regarding the resemblance of newest and preceding technologies, it’s remarkable article.